Have a webpage? Use our button. 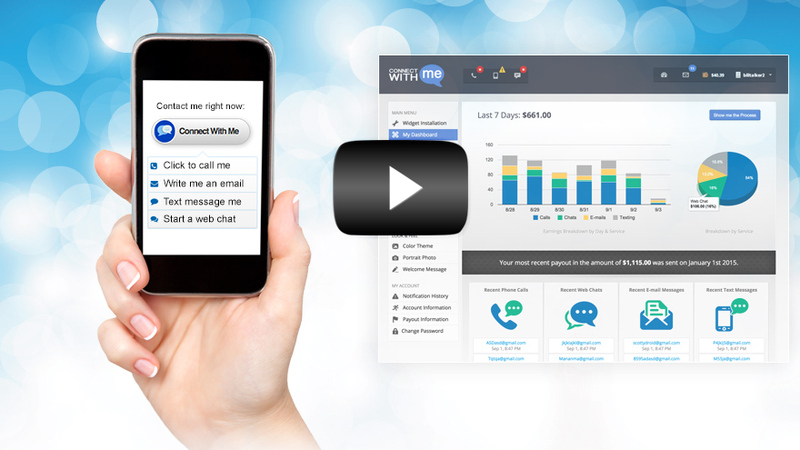 The ConnectWithMe widget instantly connects you with customers who need info you can provide. Our system will create a customizable website that displays your ConnectWithMe button. 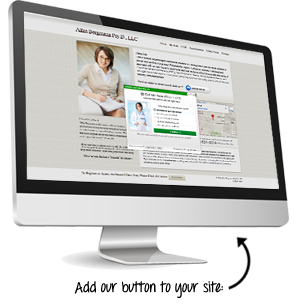 Just answer a few simple questions and immediately create your own online presence and web address that you can share with your customers, clients, or on your business cards. Your customers can use a pre-funded wallet, pay by credit card, or a combination of both. Great for information based or eCommerce sites. 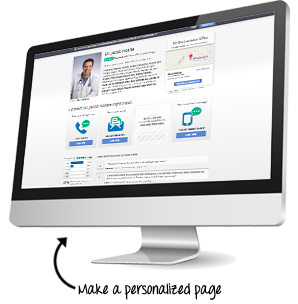 Offer more than just live chat to meet the needs of all of your customers. How do each of the different communication services work? Connect over the phone ...Your customer selects phone communication from your personalized button. We bill the customer directly and place a call to both you and the customer using our caller ID, protecting your privacy. Rates can be set by the minute, or for a block of time. Why use phone calls? Connect through texting... We provide a masked text messaging phone number to both you and your customer to communicate through your SMS software on your cell phone. You can reply to the text message directly through your phone. Why use text messages? Connect using web chat ...A chat box will appear in a pop up on their screen, all they have to do is click on it. You will then receive a popup on your screen indicating that a customer would like to speak with you. You have up to 30 seconds to accept the conversation. Why use web chat? Connect through emails ...A screen with a text field will open on the customers' computer where they can type and send their question directly to you. The first email message that a customer sends to you is free, any additional message the customer sends is .25 each. Why use email messages? Connect through Skype ...The customer will see your per minute Skype rate and add money to their wallet to begin the Skype call with you. You will download and install our third party plugin into your PC while running Skype and save your Skype handle in your account settings. Why use Skype? Try us right now and get your first 15 days free! ConnectWithMe.com is for entertainment purposes only. Inside the USA? Call: 1-800-CWM-CALL Your account and pin numbers will be right here after you login. If you do not set up an account you cannot Text, Email, or Voicemail our Experts.